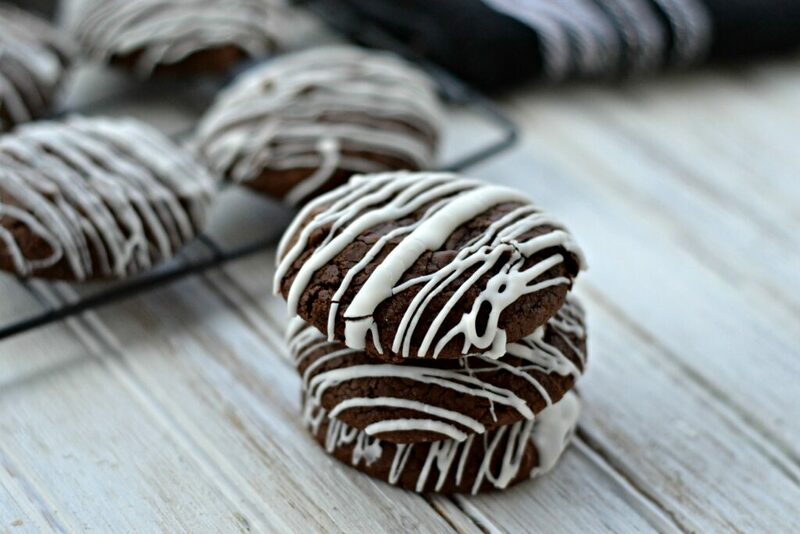 Chocolate Fudge Cookies with Drizzled White Chocolate. I don’t know about you but, chocolate is kind of my vice. It’s something that I would choose to eat all the time if I could. So, of course, when it’s in cookie form–it is no different. This recipe calls for soft, chewy and delicious chocolate fudge and it’s topped off and drizzled with white chocolate. The perfect balance, no? If you like cookies that are chewy and not crispy, well, look no further. I also don’t discriminate when it comes to chocolate, so two kinds of chocolate in one tasty treat? I am in, are you? 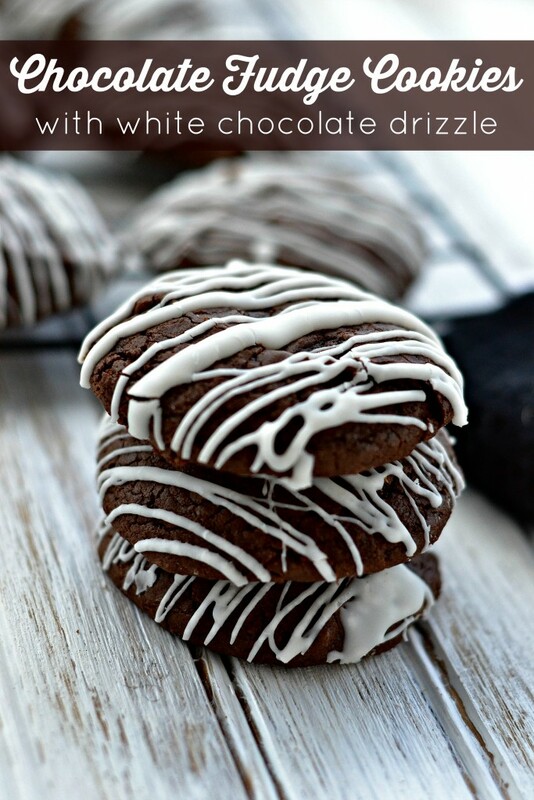 No need to scour Google for the perfect chocolate fudge cookies because you found them! A chewy, chocolately fudge cookie that's drizzled in white chocolate. Pre-heat the oven to 350 and line a baking sheet with parchment paper. In a smaller bowl whisk together the flour, cocoa, baking powder, instant coffee granules, and salt. Add the dry mixture to the wet and mix until just combined. Scoop the dough out using a tablespoon and place about 2 inches apart on the prepared cookie sheet. While the cookies cool melt the shortening over medium heat in a small saucepan. Whisk in the white chocolate chips. Keep stirring until the mixture is soupy and smooth and then remove from the heat. Drizzle white chocolate over the cookies. Whether you are the type of person like me who uses any excuse to bake a treat (just because we love to bake) or you’re a person who saves delicious treats for a special occasion. This recipe is perfect for both! Let’s face it, the holidays and comfort foods are synonymous. I think these would be just the thing for that staff party where you need to bring something. Just sprinkle it with some sugars snowflakes and you’re good to go! I know what I will be making these for! They make the perfect homemade gift for your friends and neighbours. Plus, you really can’t go wrong on any given night with a tall glass of milk. Am I right? 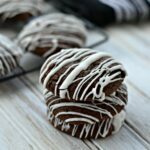 If you want a vegan version, try these vegan cookies. Are you a cookie fan? This is such a beautiful cookie recipe that I want to make real soon! Fudge in cookies are so delicious. I like the white swirls on it. Thanks for sharing! This recipe looks so delish. I first thought it was a little advanced for me but I think I could actually tackle this one. These are so pretty. They would look nice on a dessert plate. These sound and look so yummy! Thanks for sharing the recipe, I am definitely going to have to give the a try! This sounds like a great recipe,i love the look of the finished product. I love chewy chocolate cookies. I don't care as much for white chocolate,so I might just do a white icing drizzle. This sounds like a great recipe and I think I will try them out just in time for christmas!! These sound amazing! I am definitely going to make these. If they were yummy, that is all that matters! Haha, so great to hear! This is one recipe I will have to try. I love anything chocolate and these look delicious. Thanks for sharing. These are so yummy,kids really enjoyed them! Yay! So happy they do.